Karl Anderson & Luke Gallows have reportedly been pulled from WWE live appearances. Karl Anderson & Luke Gallows’ status in WWE is in question at the moment. 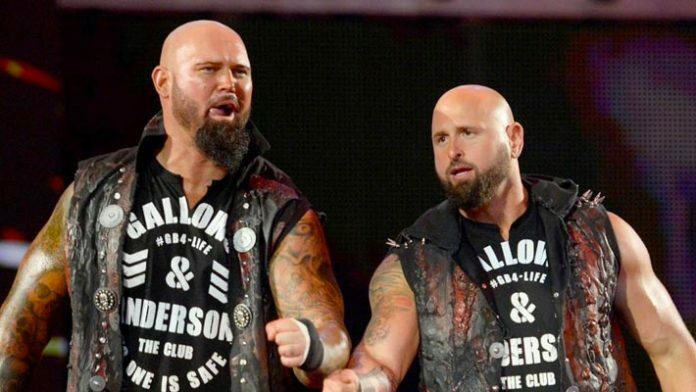 According to a report from PW Insider, Anderson and Gallows have been removed from all WWE live appearances. Some are speculating this could be because the team is reported to have turned down lucrative offers to re-sign with WWE recently. On the heels of those reports, the Wrestling Observer published a piece last week which reported that Anderson and Gallows were waiting until their contracts were up in September to decide what they are going to do. Anderson and Gallows’ previous relationship in NJPW with the Young Bucks has led to speculation the tag-team could end up in AEW if they don’t re-sign with WWE. They spoke with journalist Chris Van Vliet recently and gave their thoughts on the new promotion.